"This is a wonderful recipe that is always a hit." Preheat oven to 375 degrees F (190 degrees C). Spray a 9x13-inch baking dish with cooking spray. Sprinkle cinnamon sugar into the bottom of prepared baking dish. 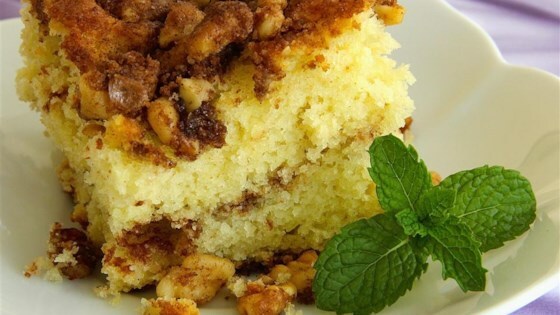 Combine brown sugar, walnuts, softened butter, 1/4 cup flour, and cinnamon in a bowl using a fork until streusel is crumbly. Mix 3 cups flour, baking powder, and salt together in a separate bowl. Beat eggs in a third bowl using an electric mixer until frothy; add white sugar and melted butter and beat until creamy. Add milk, sour cream, and vanilla extract and beat until smooth. Stir flour mixture into milk-butter mixture until batter is well blended. Spread 1/2 of the batter into the prepared baking dish; top with 1/2 of the streusel mix. Spread remaining batter over streusel layer and top with remaining streusel. Place dish on the center rack in the preheated oven; bake until a fork inserted in the center comes out clean, 15 to 20 minutes. Substitute pecans for the walnuts, if desired. Excellent. Best cinnamon coffee cake recipe I've made. Cooking time was different..about 33-35 min.. I used pecans for this since walnuts weren't on hand. It turned out absolutely wonderful after about half an hour in the oven. Perfect amount of cinnamon. Now I just need coffee!